Authors’ Note: Special thanks to Allison J. Lockard, Andrew A. McAleavey, Soo Jeong Youn, and Henry Xiao, who all helped with the creation of this paper. Since October 2001, more than 2.2 million military personnel have been deployed as part of the war in Afghanistan, known as Operation Enduring Freedom (OEF), and the war in Iraq, referred to as Operation Iraqi Freedom (OIF). These conflicts, the longest since the Vietnam War, have resulted in more than 6,500 fatalities, 48,000 injuries, and a new generation of American veterans suffering from psychological trauma and complex physical injuries (Frain, Bethel, & Bishop, 2010). With the passage of the post 9/11 Veterans Educational Assistance Act and an amendment to the Americans with Disability Act, it is expected that a large number of veterans will pursue a college education and some will seek counseling center services to cope with wartime experiences. Although the number of veterans who will seek counseling center services is difficult to predict, it has been hypothesized that the influx of returning troops may overwhelm the existing resources of many colleges and universities (Grossman, 2009). Early signs seem to confirm this possibility as the number of veterans or dependents using GI educational benefits from 2008 to 2012 nearly doubled from 540,000 to 945,000. While not all post-secondary institutions have seen surges in attendance, the number of men and women with military experience entering into campus life has dramatically impacted some geographical areas. As personnel levels continue to decrease in Afghanistan and Iraq, it is expected that even more colleges and universities will face issues related to increases in veteran attendance. Yet even with these actual and expected increases, there are many physical, psychological, bureaucratic, and social challenges that veterans must navigate in hopes of being successful in post-secondary institutions. Current evidence suggests that on a macro level these challenges are not being met, resulting in the lowest graduation rate of veteran students from four-year universities ever. While the national average for graduating from a four-year university is approximately 57%, graduation rates for returning veterans from the same institutions rests at an estimated 3% (Aud et al., 2010; Cunningham, 2012). Given the rise in the number of veterans returning from Iraq and Afghanistan, this study sought to determine the levels of distress reported by students with military experience seeking help at college counseling centers, particularly when compared to help-seeking students without military experience. Johnson et al. (2010) found elevated hostility and family concerns among counseling center clients with military experience compared to clients without military experience. Second, we investigated differences in distress between students with a military-related trauma and students who had experienced trauma but had no previous military experience. We believed that it would be useful to explore the potentially unique effects of military-related trauma as previous literature has suggested that individuals who have survived a military-related trauma may present differently than survivors of nonmilitary-related trauma. For instance, in a meta-analysis examining the association between anger and PTSD, the relationship was found to be moderated by military experience, with larger effects present for this population (Orth & Wieland, 2006). Additionally, Deering, Glover, Ready, Eddleman, and Alacon (1996) offered preliminary evidence that there may be unique patterns of comorbidity in PTSD from different sources of trauma. Findings indicated that although similarities in trauma survivors undeniably exist, comorbid profiles may vary according to the type of trauma one has experienced. Thus, counseling center clients who have experienced a military-related trauma may manifest different mental health concerns than clients who have experienced trauma outside the military. For this study, we formulated two hypotheses. Hypothesis 1: We expected to replicate the findings of Johnson et al. (2010) and hypothesized that there would be greater hostility and family concerns among students with military experience compared to those without military experience. Hypothesis 2: We hypothesized that clients who had experienced a military-related trauma would report more distress than students who had experienced a trauma but had never served in the military. The present study utilized two data sets gathered by the Center for Collegiate Mental Health (CCMH). CCMH is a national practice-research network that pooled standardized data 97 centers in 2010–2011 (CCMH, 2011), and 120 centers from 2011–2012 (CCMH, 2012). Of the 59,571 students who provided usable data in the CCMH 2010-2011 dataset, 1,251 (2.1%) reported having military experience. 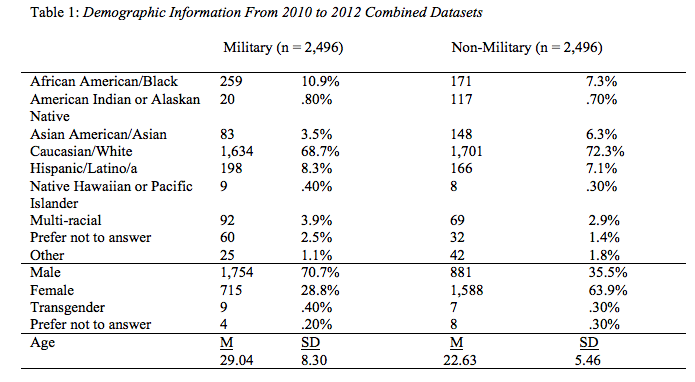 Consequently, 1,251 of their peers without military experience were randomly selected to serve as a comparison group (see Table 1 for demographic information). Of the approximate 79,000 students who contributed data to the CCMH 2011-2012 dataset, 69,167 provided usable data regarding service in the military and 1,245 reported having military experience (1.8%). Thus, 1,245 of their peers without military experience were randomly selected as a comparison group. The Counseling Center Assessment of Psychological Symptoms (CCAPS-62) is a 62-item self-report questionnaire specifically designed to assess the mental health concerns of college students (Locke et al., 2011). Students are asked to rate each item on a 5-point scale where 0 = Not at all like me and 4 = Extremely like me. The CCAPS-62 measures psychological distress using eight subscales: Depression, Eating Concerns, Substance Use, Generalized Anxiety, Hostility, Social Anxiety, Family Concerns, and Academic Distress. The CCAPS-62 has been shown to have sound psychometric properties. Each of the subscales possesses adequate internal consistency, and preliminary evidence of convergent validity has been shown through significant Pearson product-moment correlations for each subscale with appropriate and well-established referent measures (e.g., the Beck Depression Inventory with the Depression subscale and the Alcohol Use Disorders Identification Test with the Substance Use subscale) (McAleavey, Nordberg, Hayes, Castonguay, Locke, & Lockard, 2012). Details about the development of the CCAPS-62 can be found in Locke et al. (2011). 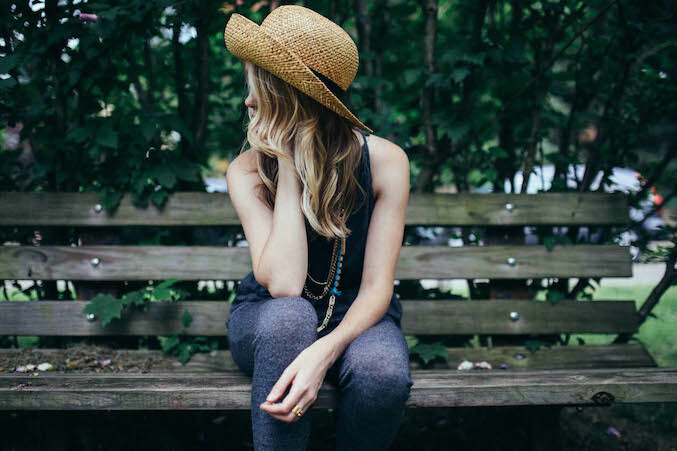 The Standardized Data Set (SDS) was developed with input from more than 100 counseling centers and represents a set of questions typically asked of students seeking counseling services (CSCMH, 2009). The present study used the SDS to assess gender, race/ethnicity, traumatic experiences, and service in the military. The traumatic experiences question asks respondents to indicate which type(s) of traumatic event(s) they have experienced. Some examples of the 23 response choices include childhood sexual abuse, military combat or war zone experiences, and physical attack. The first hypothesis was that there would be elevated Hostility and Family Concerns scores among clients with military experience compared to clients without military experience. This hypothesis was tested using the combined 2010-2012 dataset, since Johnson et al. previously had examined a previous 2008 data set. The hypothesis was supported. The average Hostility and Family Concerns subscale scores were significantly higher for clients with military experience than their nonmilitary counterparts F(1, 4261) = 71.85, p < .001 and F(1, 4261) = 47.25, p < .001, respectively. Using the benchmarks presented by Cohen (1988), however, the differences between groups on the Hostility and Family Concerns subscale represent a small effect (i.e., .26 and .21, respectively; see Table 2). Table 2 shows the means and standard deviations, F statistics, and effect sizes (Cohen’s d) for all eight subscales as they relate to military and nonmilitary personnel. The second hypothesis predicted that clients who had experienced a military-related trauma would report more distress than students who had experienced a trauma but had never served in the military. Like the first hypothesis, this hypothesis was tested using the combined 2010-2012 dataset. The results of each component of the second hypothesis (i.e., CCAPS distress subscales) are reported below. 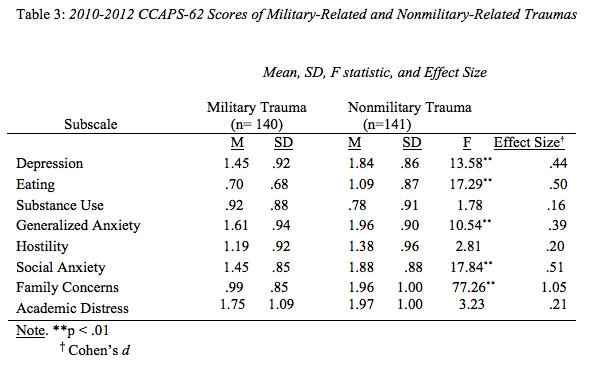 The results of a multivariate analysis of variance revealed significant differences between survivors of a military-related trauma and individuals who experienced a trauma outside the military on some, but not all, of the CCAPS-62 subscales. 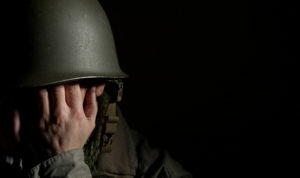 Survivors of a military-related trauma reported significantly lower distress than those with a nonmilitary-related trauma on the Depression, Eating Concerns, Generalized Anxiety, Social Anxiety, and Family Concerns subscales. This finding runs contrary to the hypothesis that survivors of a military-related trauma would report significantly higher distress scores than survivors of a nonmilitary-related trauma. Table 3 depicts these results and includes effect sizes (Cohen’s d). Using the benchmarks presented by Cohen (1988), the differences between groups for the Depression and Generalized Anxiety subscales represent a small effect (i.e., .44 and .39, respectively); the differences between groups for the Eating Concerns and Social Anxiety subscales represent a medium effect (i.e., .50 and .51, respectively); and, finally, the difference between groups for the Family Concerns subscale represents a large effect (i.e., 1.05; see Table 3). Our first hypothesis, based on a previous study conducted by Johnson et al. (2010) on a previous CCMH data set, was that clients with military experience would report significantly more hostility and family concerns than clients without military experience. This hypothesis was supported in 2010-2012 dataset. The finding of elevated hostility in students with military experience is consistent with contemporary literature. In a recent survey by the Pew Research Center (2011), 47% of post 9/11 veterans reported that they have had frequent outbursts of anger and 32% reported times when they did not care about anything. These results are troubling, as the effect of returning veterans becoming overly angry or hostile can be detrimental to their individual psyche, their families, their communities, and society at large (Elbogen, Wagner, Fuller, Calhoun, Kinnear, & Beckham, 2010). Additionally, outbursts and general hostility may be indicative of signature conflict-related injuries, such as PTSD and TBI. However, it should be noted that it is also possible that individuals with greater hostility and more family concerns are particularly likely to enter the military. It should also be kept in mind that students who had experienced trauma in the military reported less hostility than students who had experienced trauma outside the military. The elevation in family concerns was also consistent with recent literature, which has suggested the effects of military service during conflict are evident even upon a service member’s return home, and consequences are experienced by both the service member and his/her family (Warchal, West, Grahm, Gerke, & Warchal, 2011). In fact, 83% of post-9/11 veterans have reported that their families have had to make a great deal of sacrifices since the September 11, 2001, attacks, and 48% have reported that they have experienced strains in their family relations since leaving the military (Pew Research Center, 2011). We were surprised to learn that there were no elevations in rates of distress for students who had experienced a military-related trauma when compared to students who had experienced a nonmilitary-related trauma. At the same time, students who had experienced a nonmilitary-related trauma showed elevations in the areas of depression, eating concerns, generalized anxiety, social anxiety, and family concerns. We believe that there are a few possibilities as to why students who had experienced trauma within the military reported less symptomology than their civilian counterparts. First, there is a history of under-reporting symptomology in military populations for fear of decreased career opportunities and perceived stigma by peers and leaders (Hoge, Castro, Messer, McGurk, Cotting, & Koffman, 2004). Thus, these findings could be a derivative of previous cultural and/or career concerns. A second possible interpretation of the finding that students who have experienced military-related traumas tend to have less elevated symptomology pertains to resiliency. 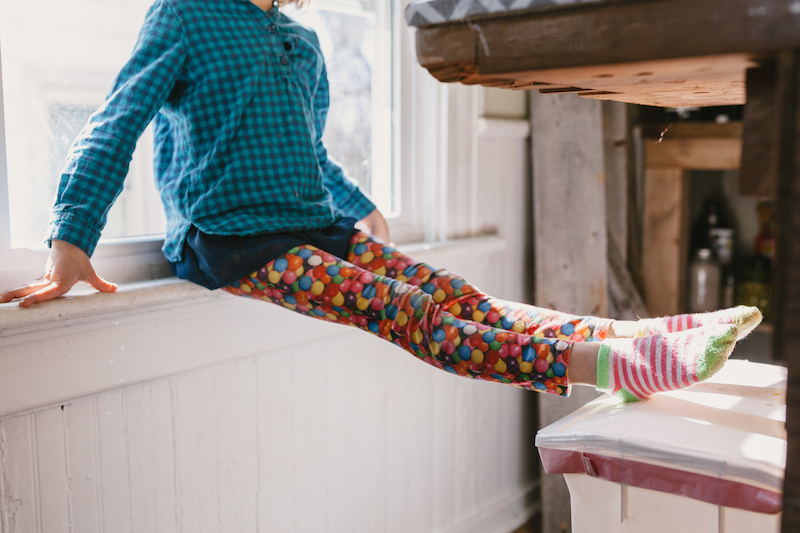 Social resilience has been defined as the “capacity to foster, engage in, and sustain positive relationships and to endure and recover from life stressors and social isolation” (Cacioppo, Reis, & Zautra, 2011, p. 44). Resilience may moderate treatment-seeking behavior among students with military experience, and it may also facilitate counseling outcomes among students who do seek help. Yet another possible interpretation of the finding is that is indicative of the protective function inherent within the insulated military culture. In other words, many war-related traumas may be experienced and discussed in the group setting. This, coupled with the knowledge that military personnel often experience debriefings and immediate accessibility to treatment services following traumas, may also help to explain the lower elevations in reported symptomology when compared to civilian trauma survivors. Overall, today’s veterans constitute a unique population that faces unprecedented challenges. 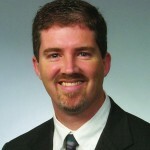 Due to a history of under-utilization, college counseling centers may need to target and even seek out veteran students who are struggling to integrate into post-secondary education settings through outreach programs that specifically address the needs and challenges of returning veterans (Church, 2009). Knowing that hostility and family concerns are disproportionately problematic in this population, outreach programs should be tailored to specifically address these concerns. Additionally, referrals to peer counseling groups and/or Combat2College campus programs [http://www.combat2college.org/] should be utilized in hopes of giving returning veterans a larger support network. 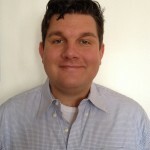 Finally, using measures such as the CCAPS-62 to identify and normalize issues common for returning veterans may prove useful throughout treatment, in addition to indicating the need for the aforementioned referral sources. Johnson, M. C., Graceffo, J. A., Hayes, J. A., & Locke, B. D. (2014). Examining distress in treatment-seeking college students with and without military experience and trauma histories. Psychotherapy Bulletin, 49(1), 7-12. Aud, S., Hussar, W., Planty, M., Snyder, T., Bianco, K. Fox, M., … Drake, L. (2010). The Condition of Education 2010. (NCES 2010-028). National Center for Education Statistics, Institute of Sciences, U.S. Department of Education, Washington, D.C.
Cacioppo, J. T., Reis, H. T., & Zautra, A. J. Social resilience: The value of social fitness with an application to the military. American Psychologist, 66(1), 43-53. Center for the Study of Collegiate Mental Health. (2009). 2009 Pilot study: Executive summary (Publication No. STA 09-160). University Park: Pennsylvania State University. Center for Collegiate Mental Health. (2010). 2010 annual report. University Park: Pennsylvania State University. Center for Collegiate Mental Health. (2011, December). 2009 standardized data set (Publication No. STA 12-00 MPC116613). Center for Collegiate Mental Health. (2012). CCAPS 2012 technical manual. University Park: Pennsylvania State University. Church, T. E. (2009). Returning veterans on campus with war related injuries and the long road back home. Journal of Postsecondary education and disability, 22(1), 224-232. Cohen, J. (1988). Statistical power analysis for the behavioral sciences (2nd ed.). Hillside, NJ: Erlbaum. 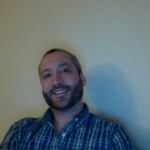 Cunningham, J. (2012). Veterans’ post-secondary education: Keeping the promise to those who serve. Hinkley Journal of Politics, 13, 14-20. Deering, C. G., Glover, S. G., Ready, D., Eddleman, H. C., & Alarcon, R. D. (1996). Unique patterns of comorbidity in posttraumatic stress disorder from different sources of trauma. Comprehensive Psychiatry, 37(5), 336-346. Elbogen, E. B., Wagner, R. H., Fuller, S. R., Calhoun, P. S., Kinneer, P. M. Mid-Atlantic Mental Illness Research, Education, and Clinical Center Workgroup, Beckham, J. C. (2010). American Journal of Psychiatry, 167, 1051-1058. Frain, M. P., Bethel, M. & Bishop M. (2010). A roadmap for rehabilitation counseling to serve military veterans with disabilities. Journal of Rehabilitation, 76, 13-21. Grossman, P (Ed.). (2009). Foreward with a challenge: Leading our campuses away from the perfect storm [Special Issue]. Journal of Postsecondary education and disability, 22(1), 4-9. Hoge, C. W., Castro, C. A., Messer, S. C., McGurk, D., Cotting, D. I., & Koffman, R. L. (2004). Combat duty in Iraq and Afghanistan, mental health problems, and barriers to care. New England Journal of Medicine 351(1), 13-22. Johnson, M., Hayes, J., Locke, B. (2010, June). 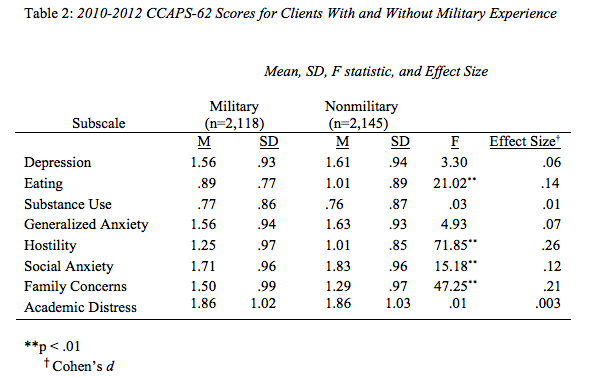 Military personnel and racial/ethnic variance in CCAPS Subscales: Quantitative data from the Collegiate Center of Mental Health’s Clinical Sample. Presented at the Annual Conference of the Society for Psychotherapy Research, Asilomar, California. McAleavey, A., Nordberg, S. S., Hayes, J. A., Castonguay, L. G., Locke, B. D., & Lockard, A. J. Clinical validity of the counseling center assessment of psychological symptoms-62 (CCAPS-62): Further evaluation and clinical applications. Journal of Counseling Psychology, 59(4), 575-590. Orth, U. & Wieland, E. (2006). Anger, hostility, and posttraumatic stress disorder in trauma exposed adults: A meta-analysis. Journal of Consulting and Clinical Psychology, 74(4), 698-706.